$21,880 as tested. Base price $18,800. $21,880. A fabulous bargain considering what you get. See comments under technology. The 2014 Fiesta comes with an upgraded 1.0 litre (you read 'upgrade' correctly), four-cylinder engine that kicks out 123 horses and 148 lb-ft of torque. This is a fantastic get-around-quick-kind-of-car; not a power-monger. It's responsive, handles well and grips the road well. For 2014, Fiesta's biggest news is a new 1.0-liter, 123 horsepower EcoBoost four cylinder engine. The engine was chosen in 2012 for Popular Mechanics 2012 Breakthrough Award and Engine Technology International's International Engine of the Year award in Europe. However, our test model was equipped with a 1.6 liter "Duratech" four cylinder engine backed by a six speed automatic transmission. Steering is fast and responsive with absolutely no need for steering correction while underway. Brakes were strong, without being grabby, too, and it almost always cornered flat and it went into curves with a great deal of dash. 39 highway and 29 city miles to the gallon. The government rating is 32 miles per gallon overall and 29 city, 39 highway. Annual fuel cost is estimated to be $1,650, and based on driving 15,000 miles a year, at $3.50 per gallon gasoline. The feds say you will save $3,250 over five years in fuel costs compared to the average new car. This top-tier 2014 Fiesta Titanium is simply a fun and enjoyable car to drive. It has an overall appeal that stacks it well against its nearest competitors-the Chevy Sonic, the Toyota Yaris and the Honda Fit. Head to head, we rank it a nose ahead (or above) the others. The Euro influence, tasty interior layout, heated seats (yummy in this cold weather) clean dash and ambient lighting, 14.9 cubic feet of packing and storage, and the opening price, sum up a winner in the subcompact market for Ford. The Fiesta is hands down my favorite subcompact. It's just a ball of fun to drive, and it's terrific in crowded urban areas. I think that the Fiesta appeals best to those who want real strong fuel economy, but want that in a stylish, fast, and responsive design. These folks-and there are a lot of them- aren't likely to buy some of the slower, more box-like competitors of the Fiesta, so Ford has hit this market pretty well with the Fiesta. 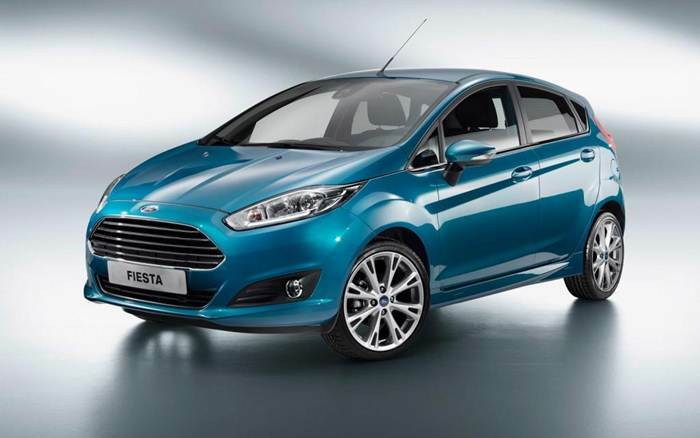 The Fiesta was such a strong performer for us that we rank it the first subcompact of choice. It's that economical, that full of value, and that much fun to drive. It is indeed a party on wheels. What doesn't this subcompact come with when it comes to driver safety? Electronic stability control and traction control are standard. Remote keyless entry, tire pressure monitoring and ABS. Driver Knee airbag, dual stage front airbag, front seat airbag, mounted side impact airbags and side air curtain air bags. The very cool and very safe Hill Start Assist feature affords driver the ability to release the brake and have the vehicle stay still for 2-3 seconds allowing you time to move your foot from the brake to the accelerator. A wonderful safety feature for those living in hilly cities like Pittsburgh, Seattle, and San Francisco. Driver Knee airbag, dual stage front airbag, front seat airbag, mounted side impact airbags, side air curtain air bags, tire pressure monitor remote keyless entry, etc. There are many technological amenities on this car, especially built into the Titanium model. Included is the push button start, rear view camera, My Touch 6.5" LCD touchscreen and infotainment system, 16" aluminum wheels, satellite radio. Then you also have dual heated seats with leather trim - the driver site has way driver adjustments (the passenger has 4 way), and the new Ford easy capless gas system that allows no vapors out with its flush closure. Just look at the standard equipment list with the Titanium model: sixteen inch aluminum road wheels, fog lights, integrated spotter mirrors, power heated manual fold outside mirrors, dual heated bucket seats with leather trim and eight-way driver and four way power passenger adjustments and an easy capless gas system. Other standard equipment includes ambient lighting, leather wrapped steering wheel, the Ford My Touch infotainment system, power windows, steering and door locks AdvanceTrac with ESC, Intelligent Access with push button start and, reverse sensing and rear view camera. The price also included a hill start system which allows you to remain stationary on a hill for up to two or three seconds after you release the brake pedal, giving you time to move your foot to the accelerator and pull away. And you know what? The options included navigation, and still the list price of our tester was only $21,800.00! We've heard and read other auto writers who've said the Fiesta costs too much when compared with other subcompacts, but we beg to differ. We have no idea, frankly, what they are talking about. Incredible design updates to the Fiesta since being introduced in 2011. Do we detect the grille has inspiration from the beyond luxury bling-brand, Martin? Perhaps ironic - but, it looks superb. Give it up to Ford designers for making such a bold statement on such a bold exterior; much improved over 2013. The Titanium level that we drove was hot all the way around, both inside and out. Panache, Sass, and Fiesty. One of the snappiest subcompacts on the market, the Fiesta packed in plenty of sporty handling and performance, and it is easily the most stylish of the the subcompact cars on the market. 3 year, 36,000 mile Bumper to Bumper warranty. 5 year, 60,000 mile Powertrain warranty. And look for a 3 year, 36,000 mile bumper to bumper warranty and a five year, 60,000 mile warranty on the Fiesta.